Quicker than your car\xCDs heater! This heated seat cushion gets warm in an instant so you\xCDll stay toasty warm on the coldest winter day. Take the chill off your car seat with this soft pad that instantly provides warm, radiant heat. Just plug the controller into the cigarette lighter outlet, and choose high or low heat. Fits car, truck, boat and RV seats\x84elastic straps keep it in place. Even doubles as a heating pad when you\xCDre camping. 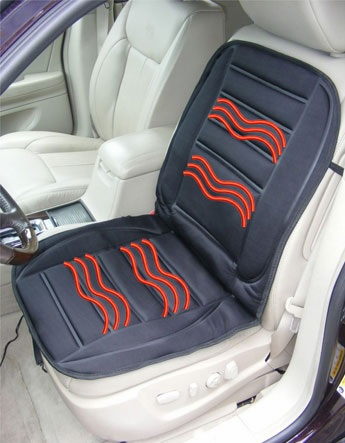 This heated seat cushion is perfect for cold weather or winter driving. Soothing heat helps to maintain your metabolism and steady blood circulation. Polyester provides comfort and is easy to clean. Simply plug the 12 volt cigarette lighter adapter into your vehicle and the cushion warms up immediately. Temperature control switch can be set to either to high, low or off. 12 volt Heated Seat Cushion provides warmth during cold winters and evenings! Stylish and comfortable cushion makes your car ride more comfortable. Yes! This is just what is needed during these cold days. Since it takes my car a short while to warm up before I can turn on the heater, this heated seat cushion heats up quickly. ConsThe straps to secure the cushion to the seat could be longer or at least adjustable There should be a way to adjust plugging in the connector for the passenger seat. The plug-in connector is only accessible for connection to be plugged in to socket that is usually located in the middle of the car and, therefore, usable by the driver but not for the passenger. Only had a chance to use it twice so, but it heats up faster than my car heater, and even on the "low" setting I could feel the warmth through my down coat. Great value for the price. Easy to attach to seat, even over blankets I have to protect seats from dog hair/dirt. Definitely recommend. ProsHeats faster than car heater. ConsNone that I've encountered so far.